Today’s been the single biggest polling day in my estimation since the 2010 elections. Three major releases all containing interesting data. The third and most surprising of those comes from Fox News, which shows Herman Cain not just in third place, but taking a top-tier position usually held in recent weeks by Michele Bachmann or Ron Paul. Facts: 364 Republican primary voters, phone survey with landline and mobile handling included. MoE 5. As I said, Herman Cain has arrived. Mitt Romney gained one point from last month to lead at 23, Rick Perry notably lost 10 points to land at 19, and Herman Cain gained 11 to finish at 17. Newt Gingrich jumped up 8 points to round out the double figures candidates at 11. What do these three big movers have in common? Rick Perry is beginning to get a reputation for poor debating, while Cain and Gingrich are getting comments that they debate well. Much as Tim Pawlenty crashed after he disappointed in a debate, giving away his support to Michele Bachmann who was ready, now it appears that Herman Cain appears viable to Perry supporters whose eyes are straying. 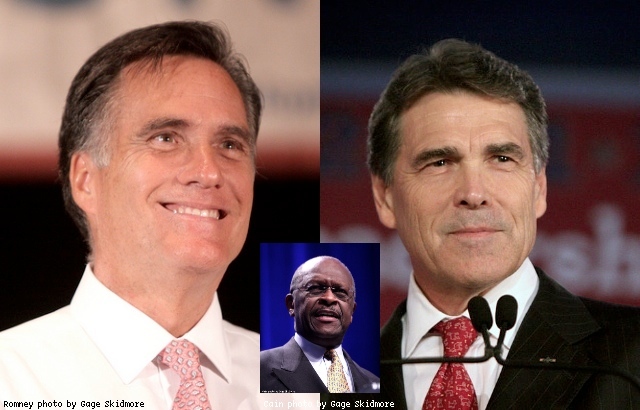 I want to start seeing favorability and unfavorability ratings for Romney, Perry, and Cain, stat. Cain, as Perry before him, will get heightened scrutiny now. Will he hold up, is the key question right now. They also have recognition in the same chart. He ALWAYS been the most favorable in their polling, but has lacked recognition. I would say scrutiny ends up doing more to help his recognition than hurt his favorability if go by how he has trended so far. Unless of course he does or says something under this spotlight that works against him. So far he hasn’t seemed to do that often though as far as those watching him and deciding his favorability. Herman Cain is liked for the most part in the mid-west. Close to the land folks like straight talk and do not appreciate the petti as MB and TP have found out. I don’t believe the issue will be color. It will be African American Culture, which does not appear to be the culture of Herman Cain or Pres. Obama. Herman Cail can prove himself by staying with the issues and his rather fresh response and solutions. I would like to see Newt and Herman team up. Herman Cain is great in a lot of ways, but anybody who is so ignorant about the problems with Muslims and their agendas and then have Cain state that he would put a Muslim in his Cabinet is shreer lunancy. It tells me that he is totally incapable of understanding the threat of Islam in the United States and with all the experts warning us of the coming problems,where does Caim get his information?